The Barred Owl or Hoot Owl - Strix varia - is almost all over the US now and is most definitely found in Sutton Massachusetts. It is about 20 inches long. Its face has a big ruff around it, giving it a appearance of having giant eyes. Its body is medium brown to tan with white ridges running all down its body and wings. Barred owls will eat squirrels, opossums, mice, woodpeckers, and quail. They are very good hunters. It's wise to keep your cats and dogs inside at night, to keep them out of the reach of these night hunters. 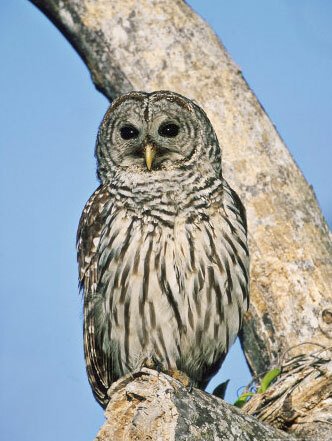 The traditional call of the barred owl is eight hoots which have a sliding downward note at the end. The pattern is "Who, cooks, for-you? Who, cooks, for-you, all?" When I hear it, it's woo HOO woo HOO, woo HOO woo HOOOoooooo. It feels like eight "words". I.e. I don't hear a "for-you" and then an "all". This first file is a video I took on October 3, 2011 on my front door step in Sutton, at 2:50am. The owl was hooting right in my front yard. You can hear the background chorus of crickets. The first four notes were all the same note. The "Hoo" - the fifth beat - was a higher note, and then it slid down to the final oooo as the ending part. This recording isn't as clear as the above video. I tried using a recorder instead of my camera. My recorder only picked it up faintly even though it sounded loud to my ears, so I had to boost the volume to help you hear it. You'll hear a background hum as a result. It sings once and then waits about 20 seconds before it repeats the song.